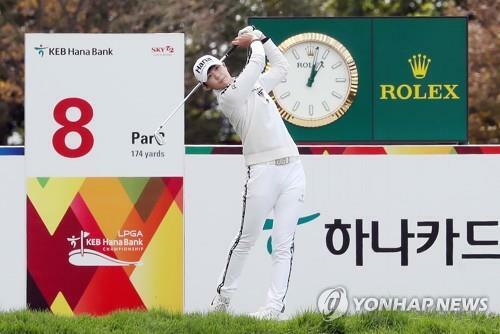 INCHEON, Oct. 11 (Yonhap) -- Park Sung-hyun, world No. 1 in women's golf, was enjoying a strong opening round at the LPGA KEB Hana Bank Championship on Thursday, when she ran into trouble at the penultimate hole. The scenic par-three 17th at Sky 72 Club's Ocean Course in Incheon, 40 kilometers west of Seoul, is famous for a giant bunker that stretches from just in front of the tee to the mouth of the small green. But there was nothing scenic about Park's double bogey there, after a botched tee shot and what Park called "a mediocre chip." That double, along with a bogey at the second, were the only blemishes to Park's round of four-under 68, which included seven birdies. Park is sitting three strokes behind the leader, Nasa Hataoka of Japan. Park, a runner-up last year, said that while she was disappointed with her 17th hole, she was able to regroup quickly, knowing there is still a lot of golf left. "I could have walked away with a bogey, but I hit a mediocre chip," Park said. "But I figured I could get at least one shot back at the finishing hole, which is a relatively short par-five (at 500 yards). And since this is only the first round, I felt pretty comfortable with where I was." And Park did get her shot back at the 18th, though she also needed some luck. Park pulled her tee shot way left and immediately pointed to left and yelled, "Fore!" But the ball bounced off the cart path and floated back on to the fairway, well ahead of her two playing partners, Ariya Jutanugarn and Brooke Henderson. "I didn't see where the ball landed at first, but I heard fans cheer," Park said. "As I started walking down the fairway, I spotted the ball. My caddie and I were pretty happy. We thought the ball went maybe 400 yards." Park is playing for second straight week in Incheon. Last week, she helped South Korea win its first title -- the UL International Crown, the LPGA's team match play competition. "Since I played last week, I came into this tournament in pretty good form," Park said. "I thought my ball-striking was a little off last week, so I tried to fix that for this tournament. I got my rhythm back and I have good feelings about this week." Park and Jutanugarn played in the same group after they went toe-to-toe in the singles match during the International Crown last Sunday. Jutanugarn beat Park 2&1, handing South Korea its only loss on the final day. Park said she felt comfortable playing with Jutanugarn again and ended up outscoring the Thai star by one shot. Jutanugarn had five birdies against two bogeys for a 69. "I don't have a lot of experience in match play, and I felt more comfortable in stroke play here," Park said. "Even though I lost to Ariya last week, I still feel I played well, and that helped me stay relaxed."